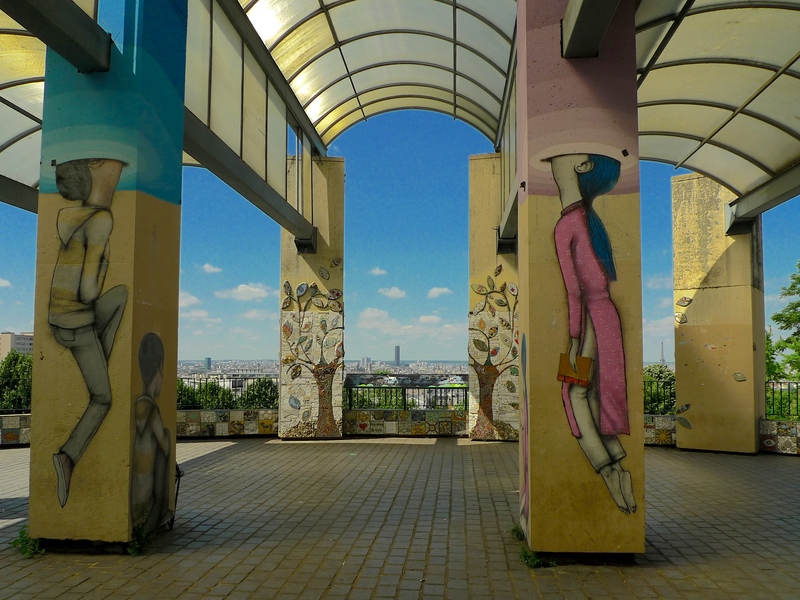 AS WELL AS BEING a plein-air gallery of street art, the pavilion at the top of the Parc de Belleville also affords a panoramic view across Paris. 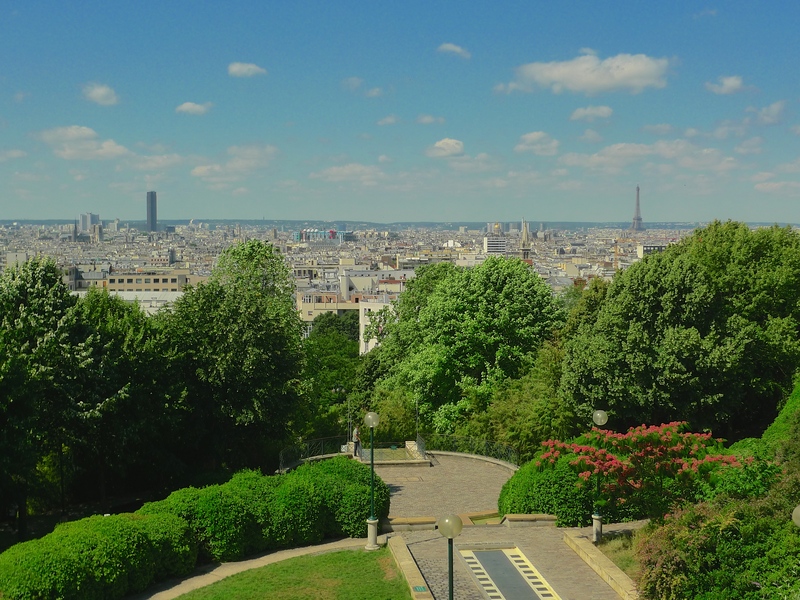 While the Parc de Belleville vies with Montmartre for the distinction of being the highest point in Paris, the Parc de Belleville is unchallenged as the highest park in the city and the view from the top is quite spectacular. 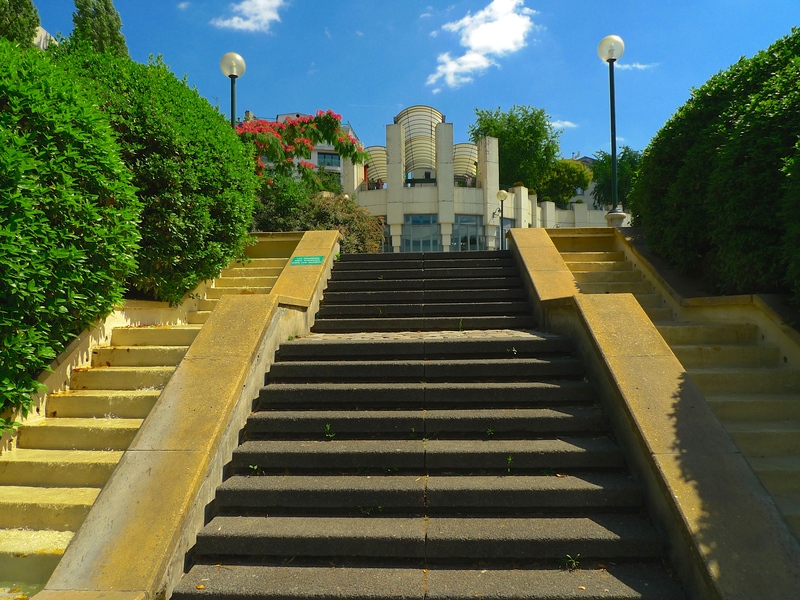 Designed by the architect, François Debulois, and the landscaper, Paul Brichet, the Parc de Belleville covers 45,000 square meters of hillside in the 20th arrondissement stretching from rue Piat in the northeast to rue Julien-Lacroix in the southwest. It was opened to the public in December 1988. In medieval times the fertile land and natural springs on this hillside were perfect for cultivating grapes and so vineyards appeared. From the fourteenth century onwards, taverns and guinguettes also began to proliferate. Guinguettes were drinking establishments that also served as restaurants and dance halls. Up until the mid nineteenth century Belleville was outside the Paris city limits and was exempt from the tax on alcohol so the taverns and guinguettes offering cheap drink were hugely popular. In the mid nineteenth century a gypsum quarry was carved out of the hillside and that attracted a population of seasonal workers who worked on Baron Haussmann’s Parisian construction projects during the winter and returned home in the summer to tend their fields. Itinerant workers together with cheap drink didn’t exactly enhance the reputation of the hillside and the area was dubbed ‘insalubrious’. 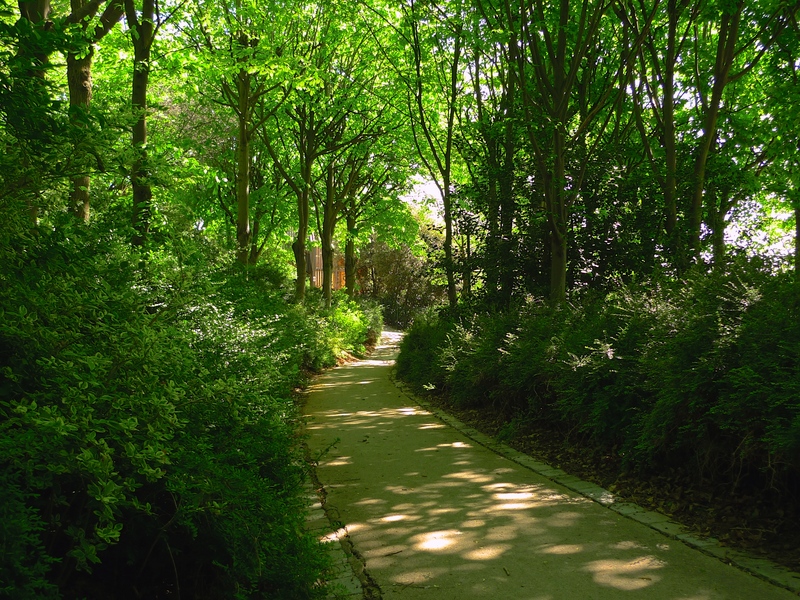 In the nineteenth century this hillside was also known for the grand party organised each year for Mardi Gras. On the last day of the Mardi Gras celebrations huge crowds came to witness the ‘Descente de la Courtille’, named after the cheap taverns and restaurants that lined the rue de Belleville. 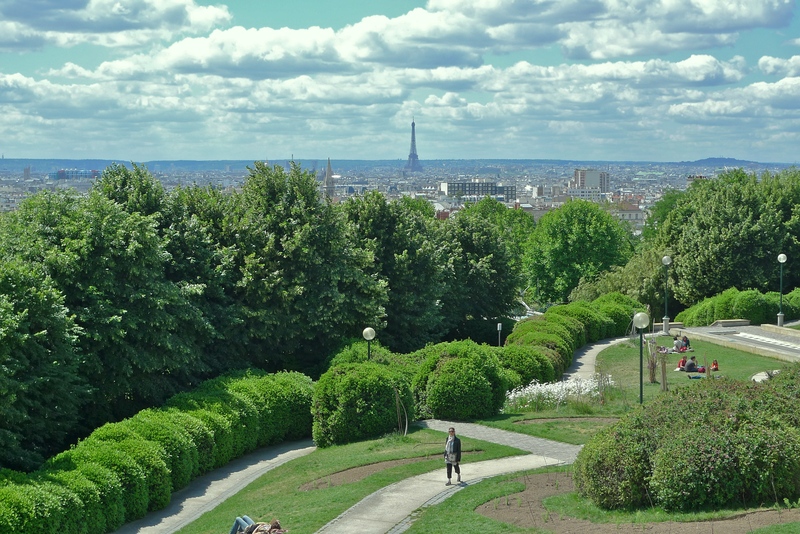 Today, the Parc de Belleville has a small museum, the Maison de l’Air, designed to highlight the importance of fresh air and the problems of pollution. There is also a wooden playground for children and an open-air theatre all set against a background of some 1,200 trees and shrubs and 1,000 m² of lawn. 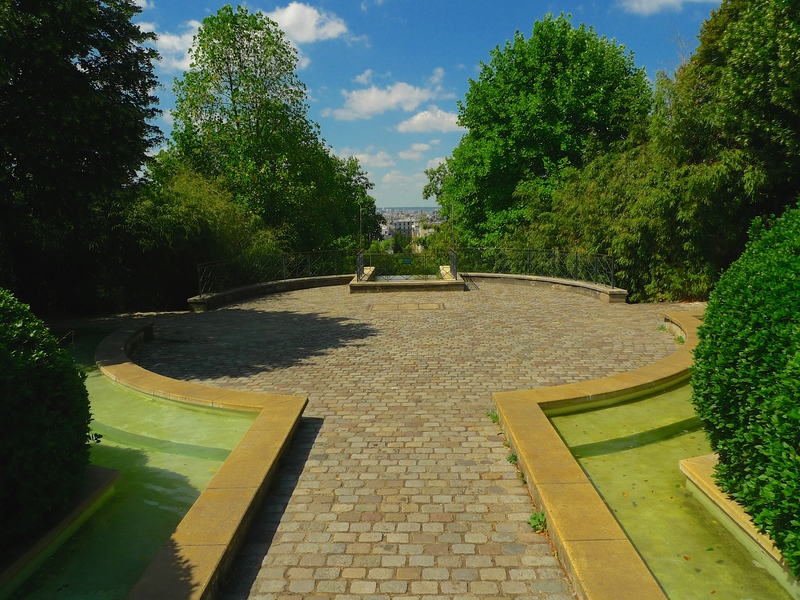 A feature of the Parc de Belleville that makes full use of the sloping hillside is the Fontaine de Belleville. The name is perhaps a little misleading because it’s really a water cascade rather than a traditional fountain. 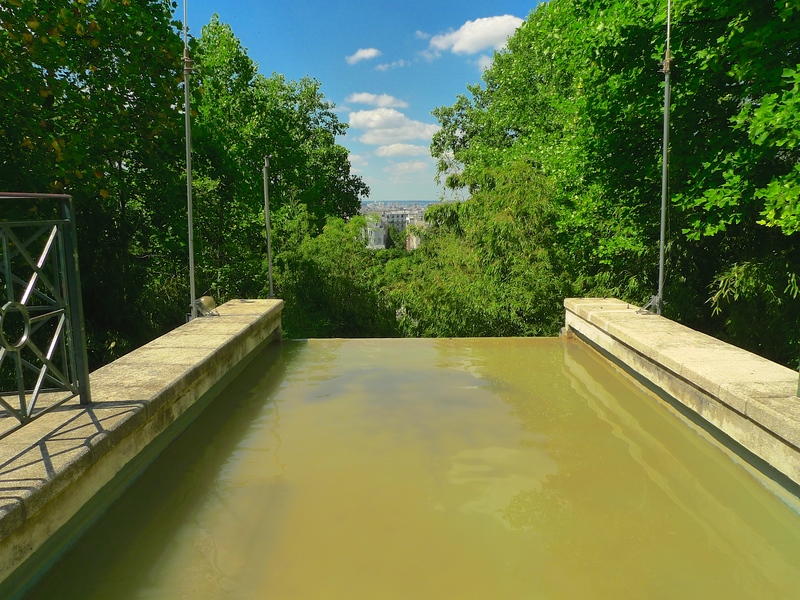 It falls for 100 metres down the hillside making it the longest water feature in Paris. 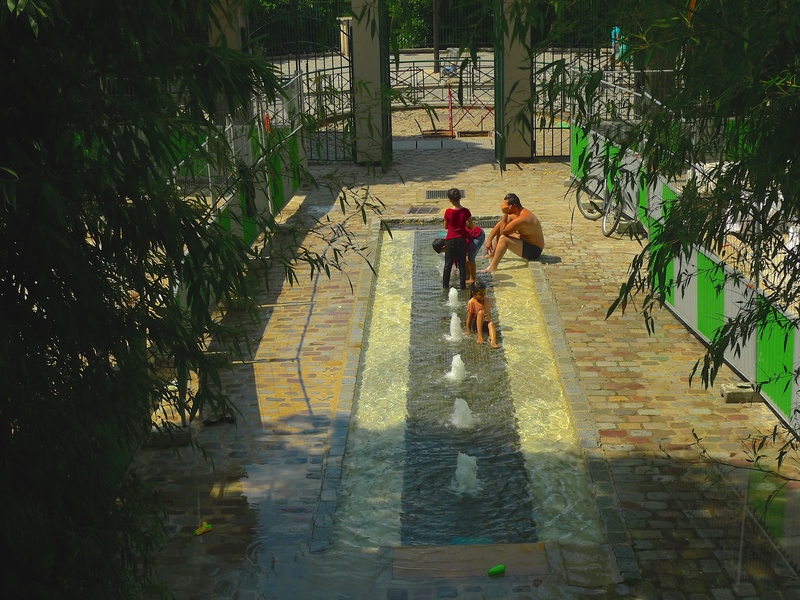 I went to the Fontaine de Belleville to explore the different sound textures as the water falls from the top of the park to the bottom. 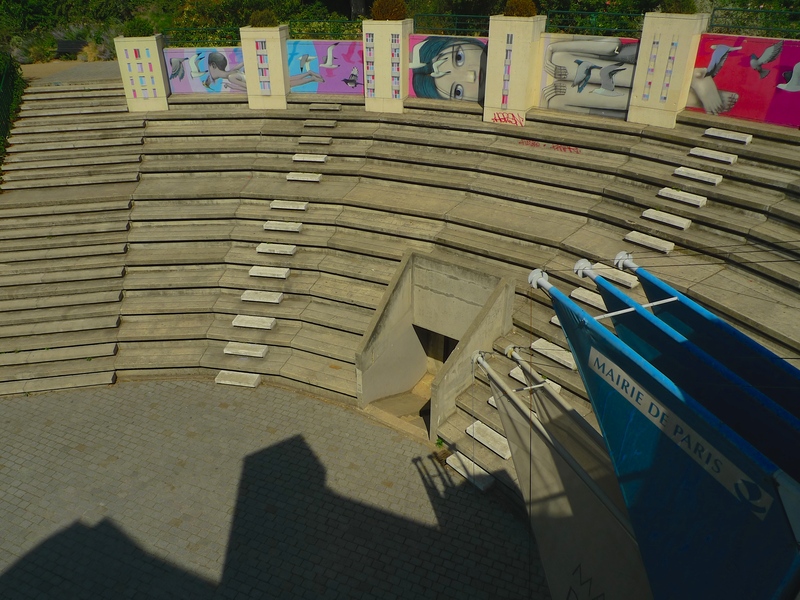 Although I’ve been to the Parc de Belleville many times I’ve never managed to be there when the entire water cascade has been working … and this visit was no exception. Some stretches were inexplicably dry and others were subject to construction work but I was nevertheless able to explore most of the cascade. 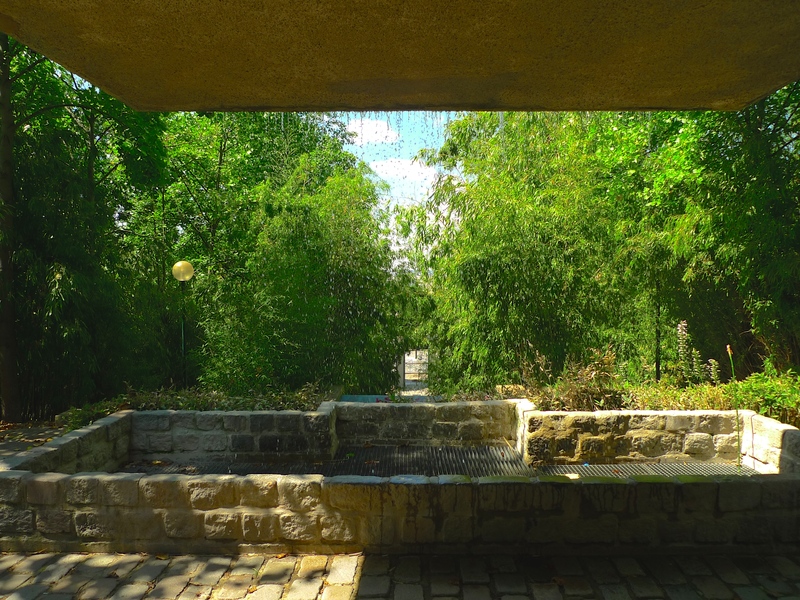 At the top of the park the cascade begins its descent in two parallel streams separated by a walkway. Each stream falls over two flights of steps into a pool at the bottom. I began recording the sounds at the foot of the pool where excess water was overflowing into a drain. Presently a little girl appeared and, bedecked in her summer dress, she jumped into the pool with a splash. This was obviously fun because she kept on doing it completely oblivious to my microphones. Moving on, I passed part of the cascade nestling in the pavé and then I came upon more steps where the cascade again splits into two. I stopped to record the water trickling over the steps on one side. I found these sounds particularly interesting. First, the sonic texture of the water seemed to be gentler and better defined at this point than it was further up the hill. Second, the speed of the water varied which changed the sonic profile. And third, there was a curious sound in the background which sounded a little like the rumble of thunder. On this particularly hot summer’s day I can confirm that it wasn’t thunder but rather the rumble of the water emerging from the previous section of the cascade from a hole at the back of the top step in what seemed like a procession of large bubbles. As each bubble burst the flow of water increased. I found this absolutely fascinating to listen to. Moving on again, I became aware that this water cascade does not operate entirely thanks to gravity, it requires assistance. 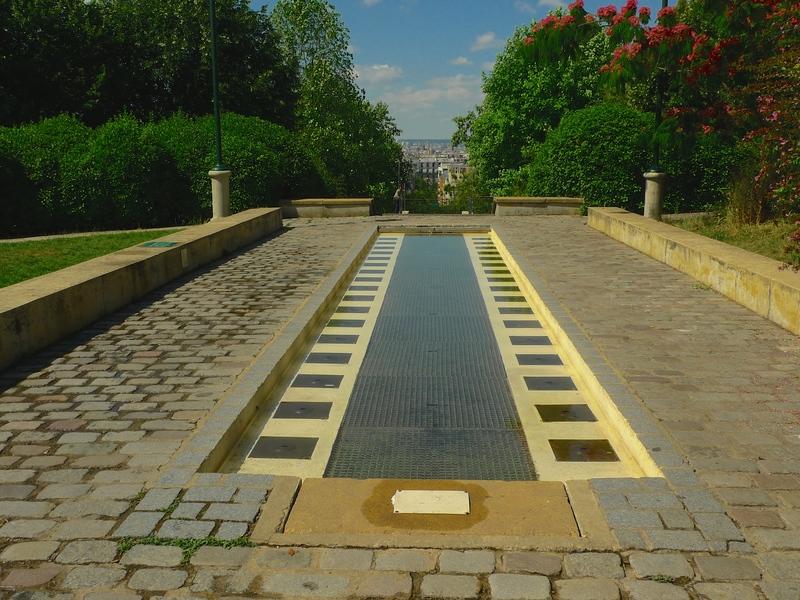 At the end of the pavé circle is a pool where the sounds of water compete with the mechanical sounds of the pumping system. I recorded sounds from the edge of the pool where the sonic texture of the water changed to more of a hiss competing with the sounds of the pumping system and where the sound of occasional birdsong provided a welcome counterpoint. 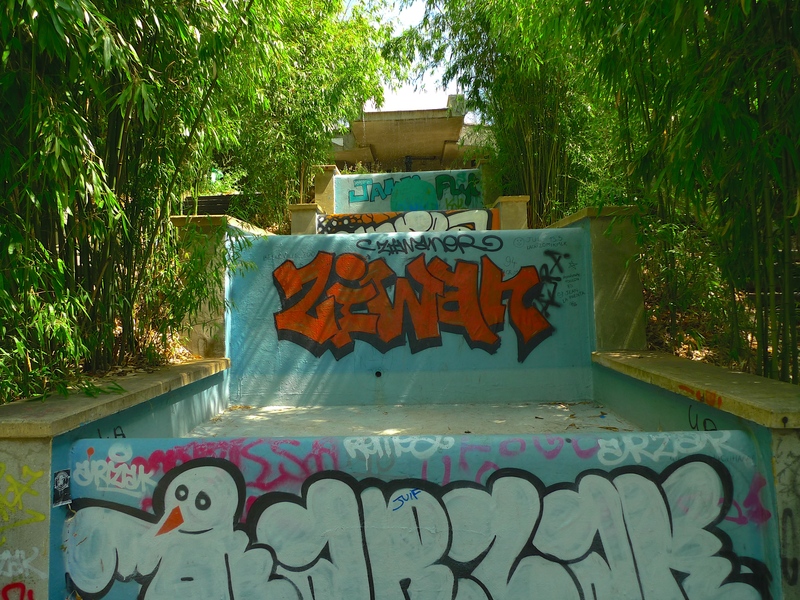 I ventured down some steps to stand underneath the pool where I found the sounds of the water falling over the edge neatly relegated the sounds of the pumping system back into second place. The pumping system is required not only to assist the flow of water down the hillside but also to pump it back up to the top again. It follows therefore that the mechanical sounds of the pumping system are as much a part of the sound tapestry of the cascade as the sounds of the water itself. This graffiti covered section of the cascade did not carry water so I could only imagine what it might sound like if it was in full flow. Below this point a large section of the cascade was being renovated so it too was out of action, which was rather a shame because it’s the part of the cascade that usually attracts most visitors especially on a hot summer’s day. 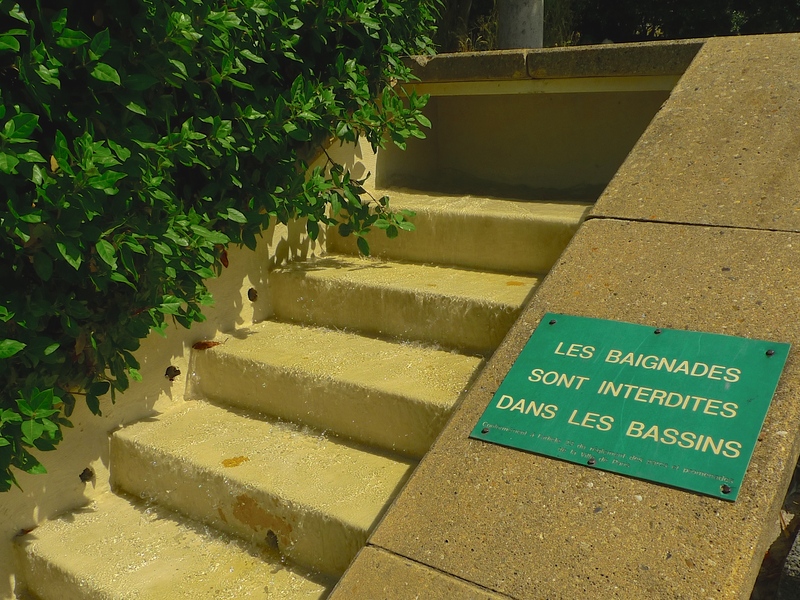 But all was not lost; this section at the bottom of the cascade leading to rue Julien-Lacroix at least was still open. 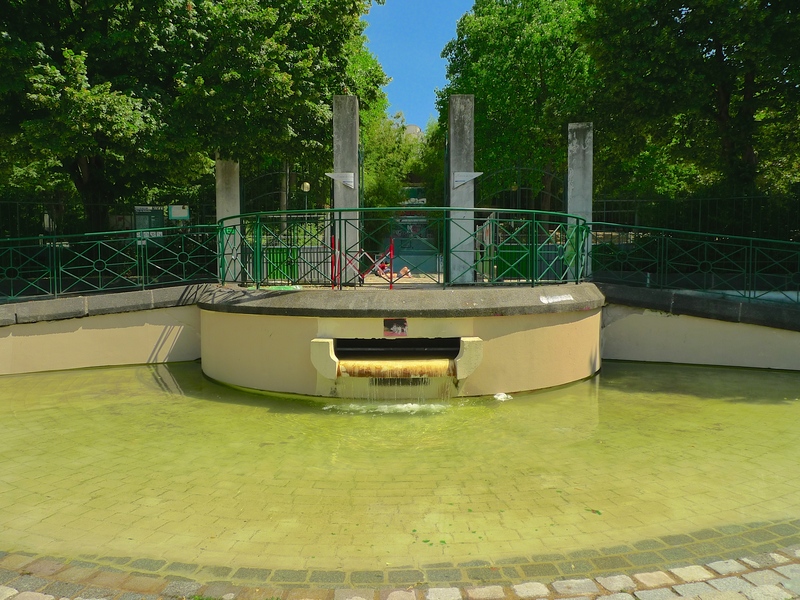 I found exploring the Fontaine de Belleville and listening carefully to its sounds a fascinating way to spend a morning.